For my final blog I used the tools I have learned with audio editing, the interviewing process, and digital storytelling to create a complete video project. When deciding what we wanted to report, my partner Kelsey Tramp and I initially chose to do a promotional video on the University of Wyoming 2013 Spring Game. However, when we realized other students would be covering that same event we wanted to do something more creative and original. Living in a college town there are a lot of bars in business, but we also know Finals Week can be a major stressor for students. Therefore, we wanted to report a feature story of the alcohol consumption during finals week and how this time of year affects student’s tendencies to drink or not. The thing I enjoyed most about this project was actually going out into the community and interviewing a variety of different students. I felt like an actual reporter collecting our video clips and gathering all of the different perspectives for our project. I also really enjoyed the accomplishment of this project. To sit down at the end of it all and play our completed video made me feel really proud of all the work we had put into this project, and to know we would be able to share it with everyone. Although, the one thing that was really frustrating was the editing process. We had a really neat idea of how we were going to lay out our video in our heads, but we underestimated the time it would take to actually do it. The Adobe Premier program crashed multiple times during our editing process and we lost a lot of the work we had done initially. After going to a technician in the IT building, we were able to get a little more help processing our video. I learned a lot from this project. I learned first with the interviewing process how to be personable with people in order to make them comfortable doing a video interview. This can be very nerve-racking for some individuals unless you talk them through it. I also learned the patience required to work with certain technology that can pose a lot of threats to your project. This is what really surprised me. With a new and updated version of Adobe Premier you would think that a two and a half minute video would not be too large of a file to work with. However, the size of our file gave the program a lot of trouble. What happens when you have a thirty minute video you are trying to edit? Either way, at the end of the timely video process we were able to create the project we had envisioned. I am glad I got the experience I did with this video project because I can see myself using it a lot in my future. With sports journalism and sports broadcasting, the research process may include gathering video interview clips with players or video clips of games that must be edited and reformatted to share. Now I at least have my feet wet and won’t be a complete deer in the headlights next time I am required to make a video project! As we begin transitioning into social media sources for journalistic outlets I was a little nervous. While I may be a very avid Facebook user, I don’t know too much when it comes to Twitter. I did have my own personal account prior to this assignment but I am definitely not an active user. Aside from the purposes of this project however, I do understand that Twitter has reconstructed journalism today and is a vital resource for reporting news and stories digitally. Not only can Twitter link several platforms of media directly from a post, but it can embed media from other applications such as Instagram for photos, Vine for videos, SoundCloud for audio, and Facebook for text. For my Twitter event I chose to step out of my comfort zone and try something new for once. I don’t often join on-campus events or participate in school activities or clubs, simply because I find myself so busy with school and a full time job. However, for this project I wanted to partake in an event that I normally wouldn’t have. With that said, I attended one of the Student Activity Council’s music events that took place here on the University of Wyoming campus. On Wednesday evening the SAC hosted the musical ensemble Air Dubai. The free event took place in the Union Ballroom when the two music artists took the stage at 8:00 p.m. The members of Air Dubai traveled to Laramie, Wyoming performing their hip-hop duo, free for all students. Jumpstarting their musical career in 2008, high school friends’ singer Jon Shockness and rapper Julian Thomas started their collaboration in Denver, Colorado as a hip-hop duo. 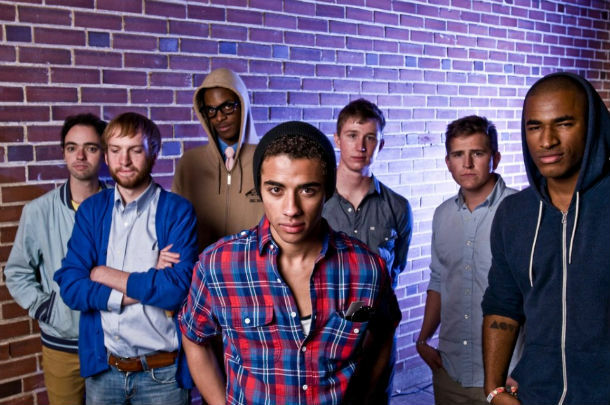 The Air Dubai band features a soulful mix of hip-hop, rock, pop, and electronic music. As of right now, the band has two official music releases titled “Wonder Age” which was first released with its official video in 2010, an by 2011 they had directed and produced their second hit single “Day Escape”. Visit their Facebook to find out more! Much to my surprise the event was something I thoroughly enjoyed. I thought it would be an event that I would only attend because it was for a school project. I was very wrong. This was definitely something I would go to on my own. The crowd was enthusiastic and the performance was one to remember. Air Dubai has immense talent and brought their audience to life even if they were limited by the stage in the Ballroom. As far as my live tweets that I posted I feel comfortable with the quality in reporting the live event. Although it seems difficult with only 140 characters per tweet, it actually made reporting easier. My tweets were very informative for some and very descriptive for others. I also enjoyed hash tagging for this Twitter event because it led me to other users who support the band either locally or regionally. The only thing I didn’t like is the fact that this event was not broadcasted or advertised to the school or to the public very well. Air Dubai has a long list of tour dates in locations all over the globe and UW was the only venue that offered it for free. As a university I feel like it should have been advertised better for more support. With that said, this made it a little hard for interviews and video for my Twitter updates. With more people in the audience it would have made for better images and video. However, I was still able to capture some good interviews with people that I tweeted whether they knew about Air Dubai before the event or not. From this project I learned that Twitter can be an extremely resourceful tool when it comes to journalism. You can update tweets to your followers within seconds of something happening and you can capture it in any media form whether it be video, audio, text, or image. I underestimated the power of Twitter and its immediacy for news, but I learned that you still have to be a cautious reporter for what information you are updating and how accurate it is. I also learned that you have to constantly remind yourself that you are reporting as a professional reporter not a personal Twitter user. Therefore, leave your personal opinions and feelings out of it! One thing that did surprise me was how easy it was to make ten tweets. Before I attended the event I was nervous that I wouldn’t be able to come up with that many different posts for one experience. But before I knew it I had well over ten tweets within the first five minutes of the concert. I realized from this that you could take several different approaches to your tweets. I made some of mine promotional, some informational, some descriptive, and some storytelling. I would not have done anything differently with this project. After completing this social media project I understand just how journalists use social networking cites to report to the public. I can definitely see myself using this in my near future as I hope to work as a sports journalist after college. Twitter is often used there as a tool to report sports statistics, breaking news, game scores, player profiling, etc. This experience has definitely given me the courage to use Twitter more in the future!